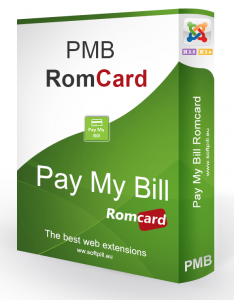 Pay My Bill Romcard is a Joomla module that enables you to take payments without any shop software like VirtueMart. Pay My Bill Romcard has Romcard payment method. Add extra fee on each payment method. In example knowing that Romcard has a fee for each transaction you can add this fee for this payment method. Customize button texts. Easily change the text shown on the buttons, in example “Click here to pay”, “Buy for only 19.99” etc.